[131 Pages Report] The organic rice protein market is expected to grow from USD 35.34 million in 2015 to USD 96.54 million by 2021, at a CAGR of 18.3% from 2016 to 2021. Increased demand for dietary protein, clean label, gluten-free, non-GMO, and hypoallergenic products has led to the growth of the organic rice protein market. The base year considered for the study is 2015, and the forecast has been provided for the period between 2016 and 2021. Organic rice proteins can meet the needs of consumers looking for non-allergen, lactose-free, and gluten-free sources of protein. Organic rice proteins have applications in sports & energy nutrition, beverages, dairy alternatives,and bakery & confectionery. Organic rice protein ingredients are being used in many product categories such as bars, powdered shakes, soups, pasta, ready-to-drink beverages, cereals, and sweet and savory snacks. They possess a diversified set of functions that enable them to be used in a variety of applications. These include emulsification, texturing, gelling, and foaming. Organic rice protein manufacturers are exploring different functionalities of rice proteins in food and non-food applications to attract a new customer base. To project the organic rice protein market size, in terms of value & volume, with respect to type, form, and application. 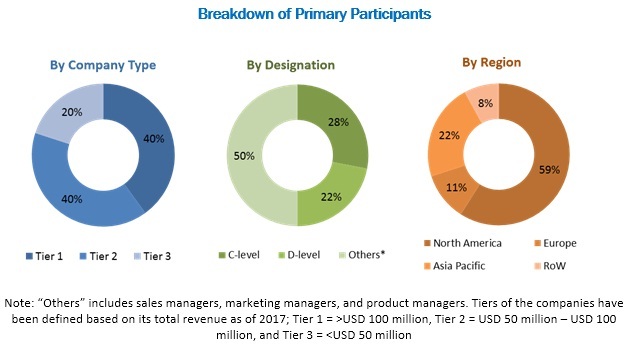 During this research study, major players operating in the organic rice protein market in various regions have been identified; and their offerings, regional presence, and distribution channels have been analyzed through in-depth discussions. Both the top-down and bottom-up approaches have been used to determine the overall market size. Sizes of the other individual markets have been estimated using the percentage splits obtained through secondary sources such as Hoovers, Bloomberg BusinessWeek, and Factiva, along with primary respondents. The entire procedure includes the study of the annual and financial reports of the top market players and extensive interviews with industry experts such as CEOs, VPs, directors, and marketing executives for key insights (both qualitative and quantitative) pertaining to the market. The figure below shows the breakdown of the primaries on the basis of the company type, designation, and region considered during the research study. 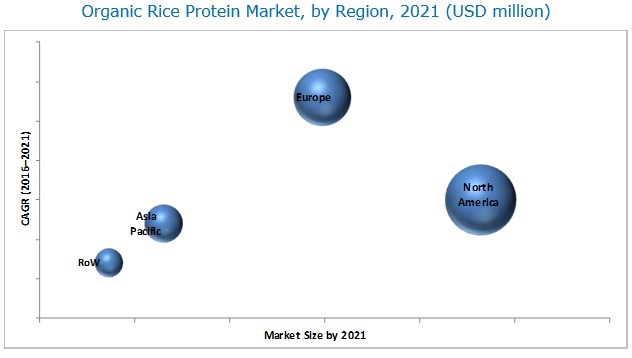 Key players considered in the analysis of the organic rice protein market are Axiom Foods (US); AIDP, Inc. (US); RiceBran Technologies (US); Shaanxi Fuheng (FH) Biotechnology Co. Ltd. (China); and Shafi Gluco-Chem (Pvt.) Ltd. (Pakistan); Golden Grain Group Limited (China); Ribus, Inc. (US); Top Health Ingredients, Inc. (Canada); Green Labs, LLC (US); and Bioway (Xi’an) Organic Ingredients Co. Ltd. (China). In February 2016, RiceBran Technologies (US) signed an agreement with Narula Group of Companies (Thailand), a leading manufacturer of organic rice. According to the agreement, RIBT would gain distribution rights for organic rice bran and organic jasmine rice bran products manufactured by Narula Group. The company would be able to distribute the products worldwide, except South East Asia, Germany, and the U.K. RIBT would be able to market additional products and gain the advantage of the growing organic rice product market trend. What are the new application areas which the caramel ingredients companies are exploring? The overall organic rice protein market is expected to grow from USD 35.34 million in 2015 to USD 96.54 million by 2021, at a CAGR of 18.3%. The increasing demand for dietary protein, clean label, gluten-free, non-GMO, and hypoallergenic products are the key factors driving the growth of this market. The organic rice protein market has been segmented, on the basis of type, into rice protein concentrates, rice protein isolates, and others. The market for concentrates is expected to grow at the highest CAGR between 2016 and 2021. 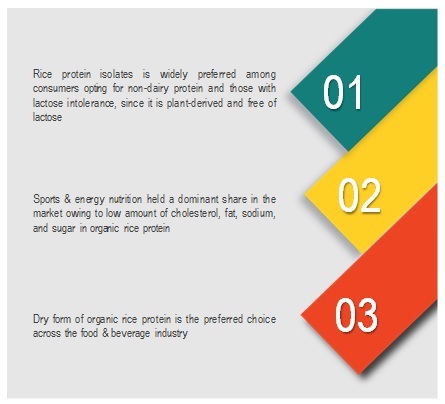 Among both the types, organic rice protein isolates are commonly used in the food & beverage industry, as it is derived from plant products and hence is preferred by lactose-intolerant consumers. The organic rice protein market has been segmented, on the basis of form, into dry and liquid. The market for the dry form is expected to grow at the highest CAGR between 2016 and 2021. Among both the forms, dry form is commonly used in the food & beverage industry, owing to the health benefits it offers. Its hypoallergenic property makes it a preferred choice of consumers with allergies. The organic rice protein market in Europe is expected to grow at the highest CAGR during the forecast period. Europe is the fastest-growing market for organic rice protein. Eastern Europe is expected to offer high growth prospects in the coming years, owing to the economic growth and increased demand for processed foods with high nutritional value compared to Western Europe. As a result, Europe holds a significant share of the overall organic rice protein market. Application of organic rice proteins in sports & energy nutrition is attributed to their high amino acid profile and branched chain amino acids (BCAAs), which are essential for athletes and bodybuilders for muscle recovery. The key reason for the application of organic rice proteins in sports & energy nutrition is weight management. Organic rice proteins administer increased lean body mass, skeletal muscle hypertrophy, power, and strength similar to whey protein. This application segment has potential scope in the near future, with increasing application of organic rice proteins as a nutrition enhancer in common food products. The amino acid profile of organic rice proteins allows them to be used as a supplement in various beverage products. The soluble fibers present in organic rice proteins have similar functional gelling properties as those present in gel fiber. This functional property of organic rice proteins improves mouthfeel and helps in stabilizing smoothies and shakes. Water solubility is one of the key functional properties of organic rice proteins, and hence, they are widely used in beverage applications. Attributes such as clean flavor characteristics, exceptional solubility, and nutritional value make organic rice proteins ideal for use in a variety of beverage applications such as shakes, smoothies, fortified waters, alternative dairy products, and powdered beverage mixes. Moreover, compared to other plant-based proteins, organic rice proteins are hypoallergenic and more environmentally sustainable. Hence, the application of organic rice proteins in beverage applications is considered safe. Organic rice proteins are used as an alternative to eggs in snacks & bakery items since it has similar properties. Both organic rice proteins and egg proteins have similar emulsion characteristics. Research and quality tests have demonstrated that organic rice protein isolates and concentrates can perform functions similar to eggs in cookies, cakes, muffins, pasta, and waffles. Organic rice proteins are hypoallergenic, gluten-free, and are vegan; hence they find application in meat analogues & extenders. Organic rice proteins are derived from organic rice through an extrusion process, which changes the structure of the protein to more or less fiber. This fibrous property and texture generated in proteins after rehydration makes them a preferred option to be used as meat analogues & extenders. What are the upcoming industry applications for organic rice proteins? The major restraining factor in the organic rice protein market is low consumer awareness. Health-conscious consumers are well aware of the benefits of a protein-based diet. They are also aware of protein sources such as whey, soy, and pea. Other sources such as rice, canola, and potato are still not popular among consumers. Key players in the market include Axiom Foods, Inc. (US); AIDP, Inc. (US); RiceBran Technologies (US); Shaanxi Fuheng (FH) Biotechnology Co. Ltd. (China); and Golden Grain Group Limited (China). Other players include Shafi Gluco-Chem (Pvt.) Ltd. (Pakistan); Ribus, Inc. (US); Top Health Ingredients, Inc. (Canada); Green Labs, LLC (US); and Bioway (Xi’an) Organic Ingredients Co. Ltd. (China). These players are increasingly undertaking new product launches, expansions, acquisitions, and agreements to penetrate the market further. 14.7 Bioway (Xi'an) Organic Ingredients Co., Ltd.